You have a new venture in mind. And you’ve crafted a business plan so detailed it’s a work of art. According to John Mullins and Randy Komisar, you shouldn’t get too attached to it. 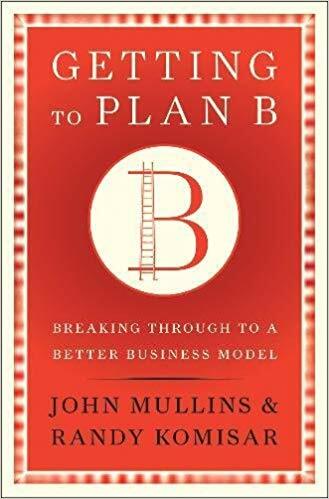 Getting to Plan B explains how new businesses are fraught with uncertainty and require real time changes to the plan in order to succeed. In fact, studies show that entrepreneurs who stick slavishly to their Plan A stand a greater chance of failing. The authors provide a rigorous process for stress testing your Plan A and determining how to alter it so your business makes money, solves customers’ needs, and endures. You’ll discover strategies for: Identifying the leap-of-faith assumptions hidden in your plan; Testing those assumptions and unearthing why the plan might not work; and reconfiguring the five components of your business model-revenue model, gross margin model, operating model, working capital model, and investment model-to create a sounder Plan B.